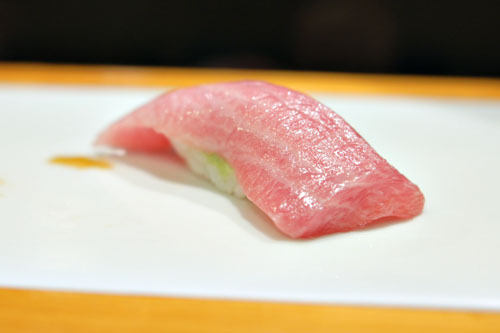 Stellar sushi in Fountain Valley? That's what I kept hearing about Kasen. 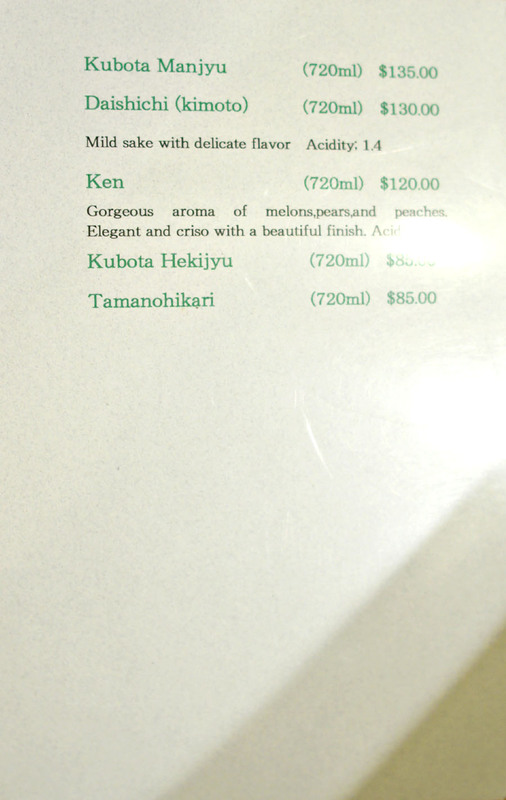 The restaurant is the work of Chef/Owner Susumu Ii and his wife Keiko. After being trained in Japan, Ii came to the US in 1977, and, supposedly, trained under Shibucho's venerable Sakae Shibutani. He opened Kasen in October 1990, serving only traditional sushi and none of the crazy rolls that Americans had grown to like--a pretty novel idea at the time. 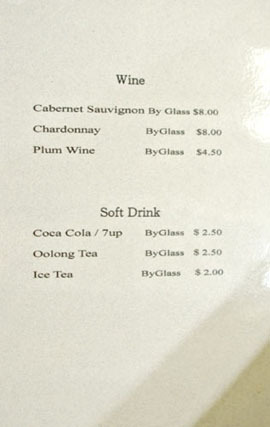 I'd actually visited way back in 2007, but the place sort of fell off my radar after that. The restaurant ended up closing at the end of April 2009 when the couple returned to Japan to take care of Ii's sick parents. 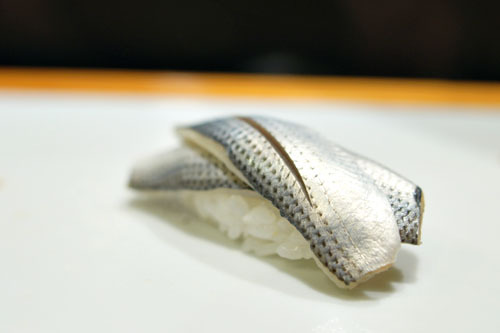 In the interim period, Kasen became Sushi Cocoro under new ownership, but that place quickly folded, once again reverting to Kasen when Ii returned in early 2010. Since then, the restaurant has been "rediscovered," with many reports placing it among the top sushi places in Orange County. As such, a revisit was certainly in order. 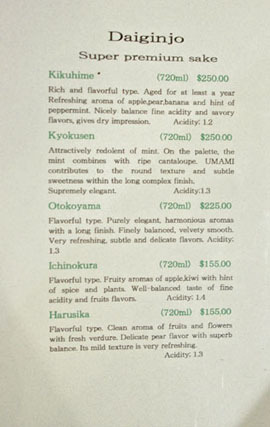 As for Kasen's menu, it's definitely well-edited, featuring only a handful of items, pretty much all of which are variations on sushi (no tempura, teriyaki, or other such frivolities here). 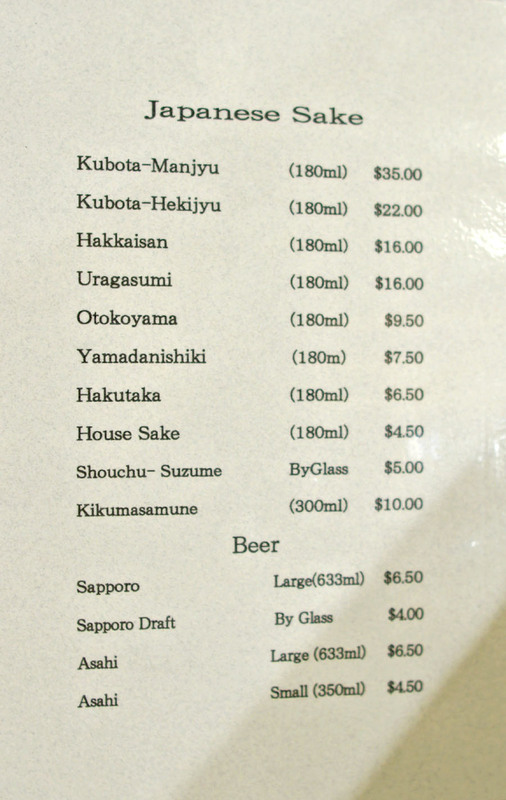 Of course, there's the omakase option as well, which we indulged in; there's no set price for it per se, but we got out for $125 a head, not including tax, tip, or tipple. 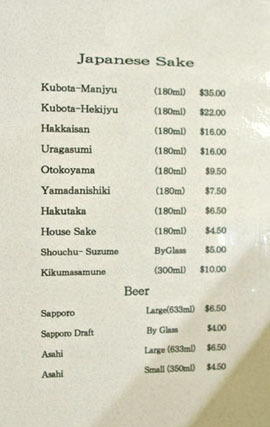 To drink, you have your standard Japanese beers, but also quite a nice list of sakes, by the glass and by the bottle. Click for larger versions. 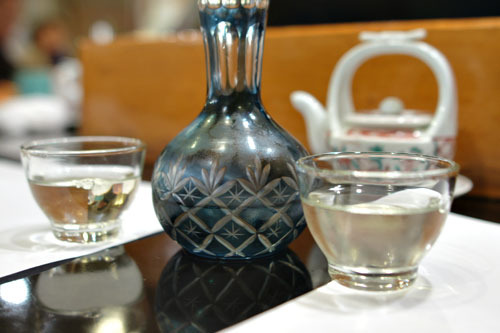 We began with a small carafe of the Uragasumi [$16.00] from Miyagi Prefecture. 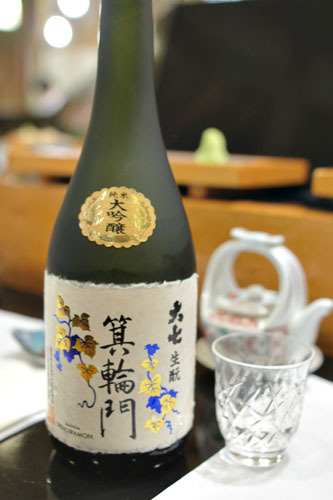 I quite liked it, finding the sake's light, fragrant, fruity character very well balanced against the delicate, subtly savory notes of rice and earth present. The requisite gari (pickled ginger) was soon placed before us. 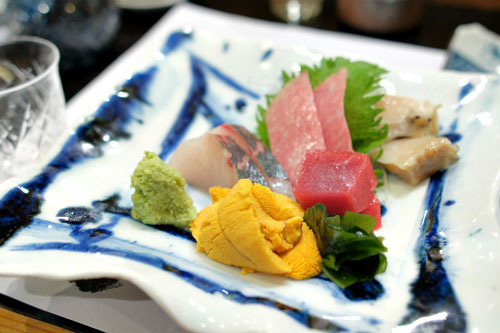 The Chef's sashimi platter brought us no less than five pristine varieties of seafood. I started with the tuna, which was about as good as it gets, with a delightfully soft, supple consistency and subtle, creeping brine. 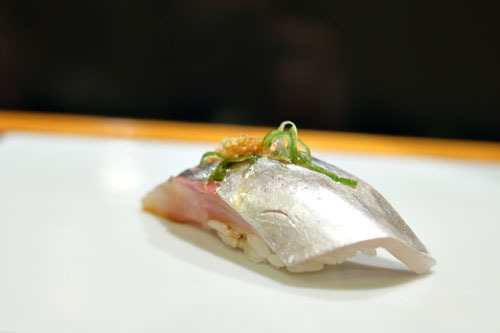 The shima aji was also much appreciated for its firm, yet yielding texture and mild, clean relish. I followed that up with the abalone, which was as crunchy as you'd expect, with a lovely salinity that was beautifully set off by the wasabi. The rough tongues of sea urchin, meanwhile, were spot on--creamy and oh-so sweet, perfect without any accoutrements at all. Last up, of course, was the toro, which was right up there with the best I've had: fatty, melty, and just oozing oil, barely requiring mastication. 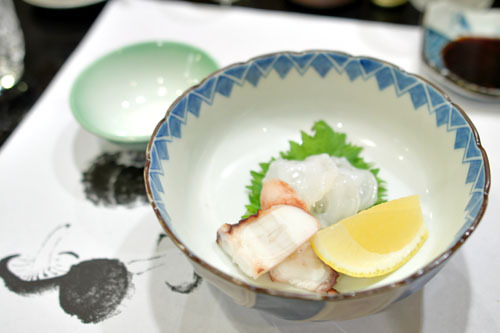 Our next plate featured octopus from Japan, in both steamed and raw forms. The steamed preparation was chewy, dense, and satisfying, with a certain "hammy" savor to it, while the raw was even better, with an almost gelatinous consistency and a mild taste beautifully opened up by the application of lemon and salt. 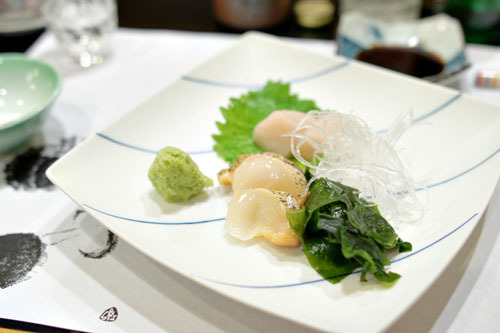 The third sashimi course had the rather uncommon tsubugai, as well as scallop. 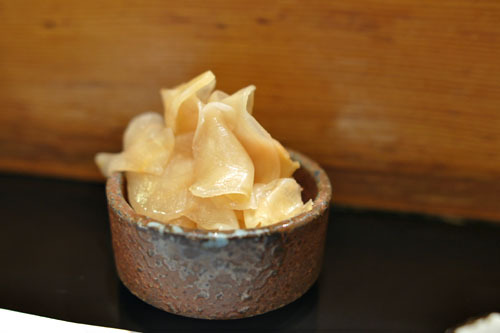 The former was a type of whelk, or conch from Hokkaido, and conveyed a very focused brine and satisfyingly crisp texture; it was delicious when taken with the included wakame seaweed, and even better with a dab of wasabi. Raw scallop from Hokkaido, meanwhile, was on point as well, with a fantastic consistency and a creamy, sweet sapor that I found quite endearing. 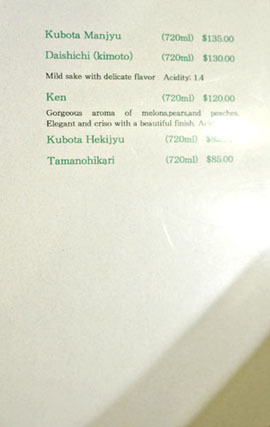 For our second sake, we went with a bottle of the Dai Shichi Minowamon Kimoto "The Gate" [$130] from Fukushima prefecture, which I'd actually had not long ago at Raku in Las Vegas. A junmai daiginjyo, this one was quite nice, with a certain heft and complexity to it--a lovely balance of sweet, savory, and alcoholic flavors. With the sashimi dispensed with, we soon moved on to the sushi portion of the meal, and what better way to start off than with this kelp-marinated flounder. The fish was lovely, with an almost sticky consistency and a complex taste tinged by just the right amount of kombu character, all finished by some wasabi heat. A beautifully crimson cut of marinated tuna was delicious, with a perfectly supple bite and great depth courtesy of its savory-sweet marinade. 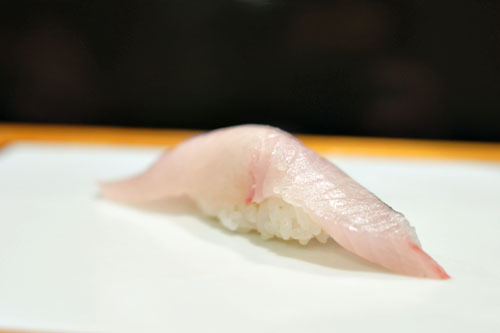 Amberjack I found satisfyingly firm, with a clean, smooth savor that was really opened up by a dab of soy sauce. 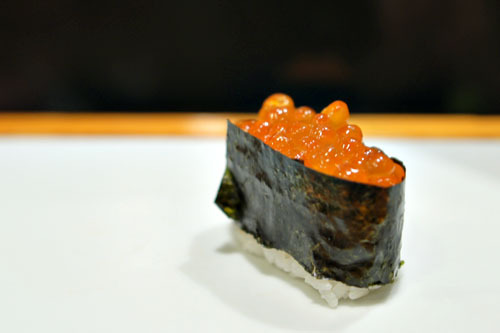 Globules of salmon roe were delightful--salty bursts of ocean-y goodness that melded wonderfully with the moderating combo of nori and rice. 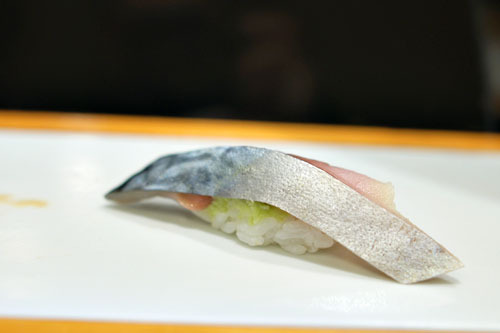 A shimmering cut of jack mackerel was one of my favorites, really showing off the sheer brininess of the fish, but in a very delicate manner. 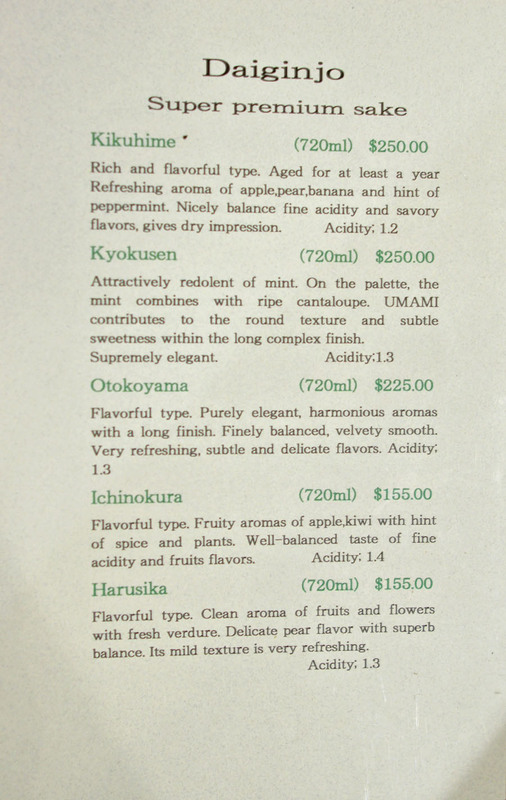 Loved the countervailing ginger and wasabi here as well. This white-speckled tuna belly looked gorgeous on the plate, and was even better on the palate, displaying loads of classic toro flair: oily, melt-in-your-mouth, and yes, unctuous. Another cut of mackerel arrived, and compared with the aji, this one was much more intense, but still not overwhelmingly so, with a fantastically "meaty" texture to boot. I rarely see cooked shrimp when I have sushi, but the presentation here was actually surprisingly good. It had a great crunch to it, and its sweet, saline flavor was intact as well. 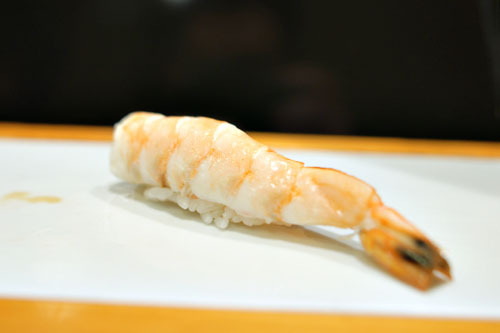 I still wouldn't prefer the ebi to a good amaebi, but you certainly wouldn't go wrong with this. 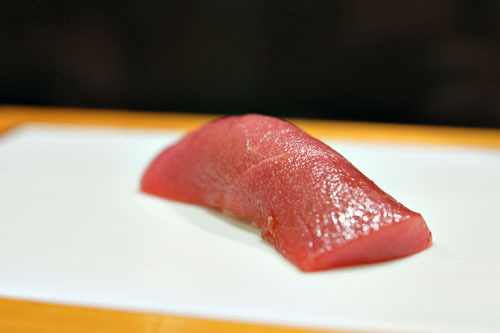 Next was a hosomaki filled with chopped tuna, and not just any tuna, but toro. It might've been the best tuna roll that I'd ever had, with the lush, luxurious tuna melding beautifully with the contrasting flavor of its nori wrapper. 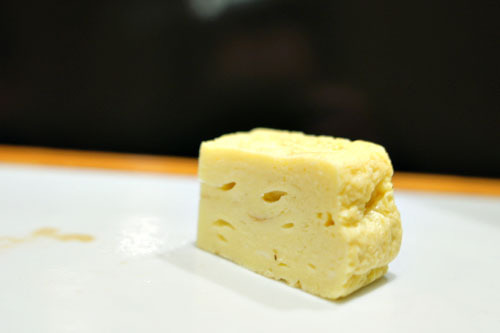 The egg omelet was on point--cool, sweet, and dense--but we knew its appearance meant that the standard gauntlet of sushi was coming to an end. 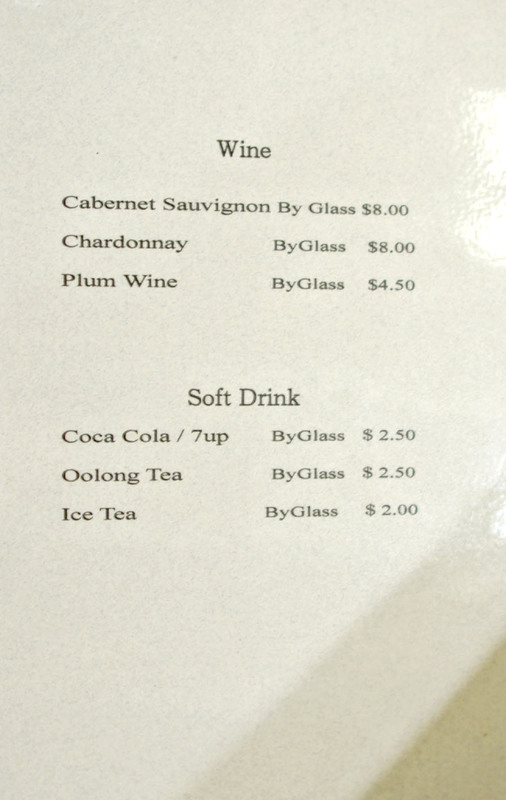 At this point, we were asked if we wanted anything else, and we happily obliged. Our first request was the gizzard shad, and it did not disappoint, showing off its wonderfully firm body, beautifully spotted-silver skin, and fishy relish on the tongue. I requested the aoyagi no himo next, which is the fringe of the round clam, something that I'd had only once before at the fantastic Nozomi in Torrance. This one was all about the texture--spongy, snappy, and utterly satisfying--paired with the lingering, saline taste of the clam. 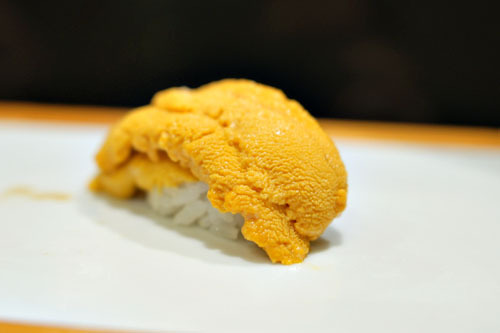 The uni was a must-order as well, and was pretty marvelous, with an initial flavor loaded with sweet, creamy nuances, all leading to a subtle, creeping brine on the finish. About as good as it gets. 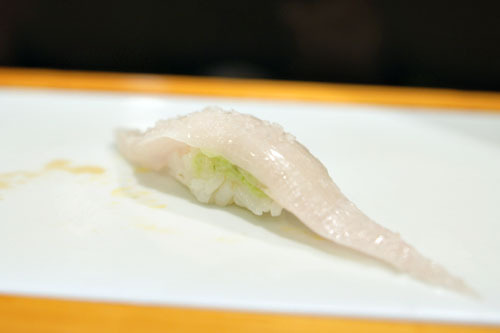 We ended with the hard-to-find engawa, which is basically the fin of fluke. 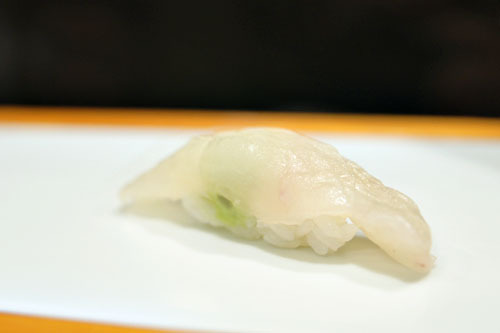 Here, texture is key, and the beauty of engawa is its chewy consistency, which was on proud display. Flavor-wise, the fish was pretty subtle, but perked up by a well-placed sprinkle of shio (salt). At this point, we were offered our choice of three desserts (all made in-house), and naturally, we went with one of each. 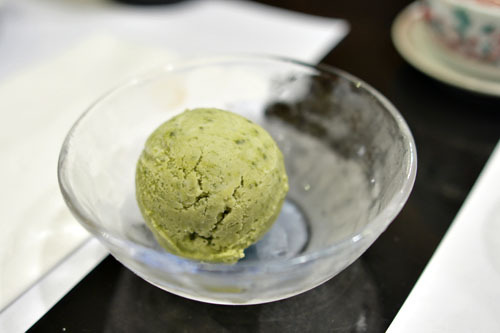 The green tea ice cream really showed off the pure, bitter essence of the matcha, and was quite fetching actually, though I would've preferred a smoother, less gritty consistency. 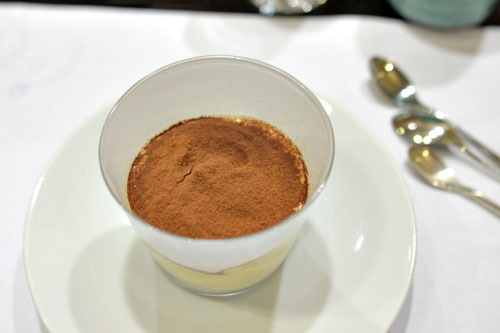 The tiramisu, meanwhile, offered up some very classic influences, and was quite to my liking with its sweet, creamy flavors, taken up a notch by the astringency of coffee toward the finish. Last up was the red bean panna cotta, my favorite of the troika. 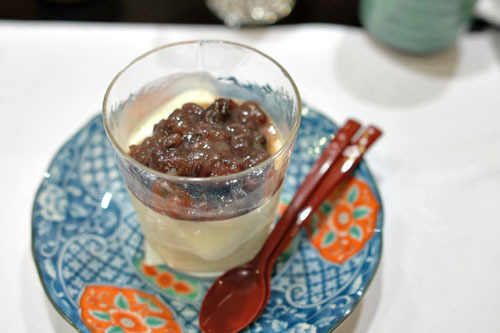 Made from fresh cream and condensed milk, it was a joy to eat, with the custard playing gorgeously against the sugary weight of azuki. Kasen turned out to be quite the amazing experience, and managed to handily exceed any expectations that I'd had. It was a near-flawless meal, and I couldn't really fault the flavors or quality of the ingredients presented. With this dinner, Kasen has been undoubtedly promoted to the crème de la crème of Orange County sushi restaurants, joining the likes of Ohshima, Nana San, and Shibucho. 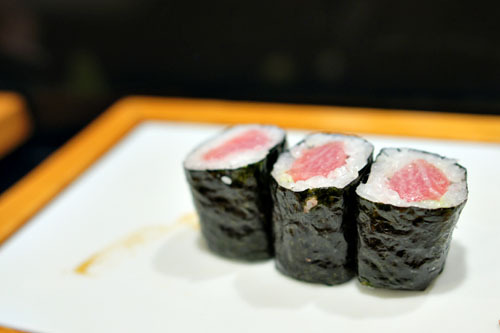 If you're a fan of sushi in OC, then Kasen needs to be on your to-eat list.